I'm wild about elephants. 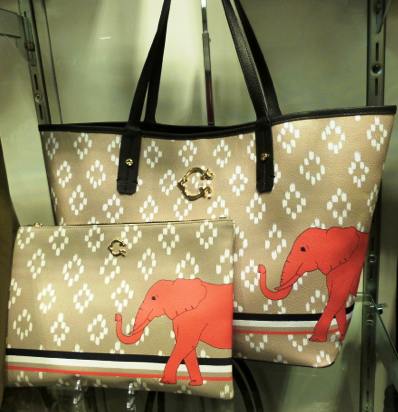 An elephant motif adds a whimsical touch to any outfit. Today I'm highlighting a few of my favorite elephant inspirations, in a variety of price points. 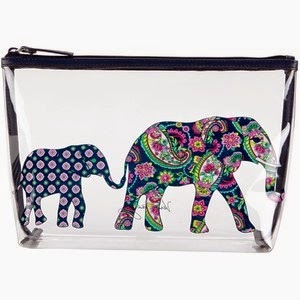 A Mommy and baby elephant stand out on this gorgeous clear cosmetic bag in Petal Paisley. It's a perfect choice for wet bathing suits or sunscreen during the summer. I think that it might even get a friendly nod from a TSA agent at the airport, clearly showing your cosmetics and lotions. Yesterday, I wore my Kenneth Jay Lane elephant bangle. The bracelet is 18K gold-plated with enamel fill and Swarovksi crystals and is a sophisticated choice for any bracelet stack. Of course, I adore pink and green elephants. 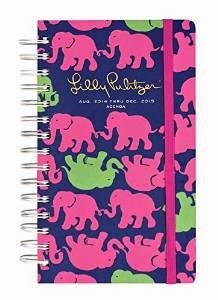 The Lilly Pulitzer Medium Agenda Day Planner Tusk In Sun 2014-2015 is my top pick. I'm counting down the days until August so that I can use my new agenda. 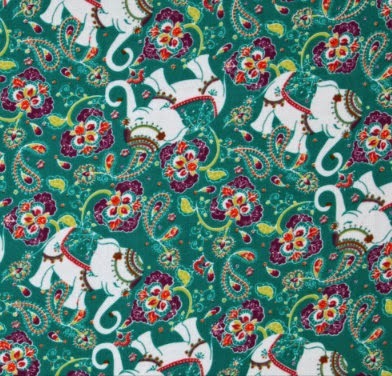 On Instagram and Etsy, I spotted some gorgeous elephant fabric and knew that I needed to order a skirt for fall. Corduroy is so comfortable and perfect for cooler weather. Isn't my skirt going to be adorable? Although I'm certainly not wishing for cooler weather any time soon, I am really looking forward to wearing a Corduroy Elephant Skirt! The Printed Signature Tote combines ikat and and elephant motif in a way that makes this bag a neutral in your wardrobe, matching many outfits in different colors, styles, and seasons. The tote in the last photo is too cute!